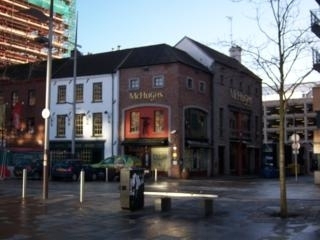 McHughs bar is found in a pedestrian zone near the Albert Clock and Custom Square. There are three levels to this bar, ground floor, underground and also the restaurant upstairs, we also have 2 menu's in the restaurant 1 with snacks and 1 with dinners. Originally built more than 300 years ago, McHughs is a good bridge between Belfast city centre and the Odyssey. If you're looking for a place with efficient staff and a great atmosphere, then you're sure to enjoy paying a visit to McHughs. 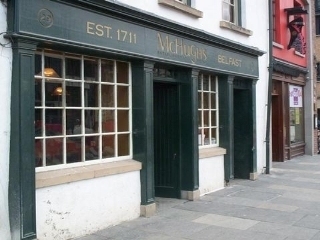 McHugh's is conveniently located within the centre of Belfast, within the city's oldest surviving building! Visit the website to take a look at menus, and to see upcoming events. Take a look below to read customer reviews and ratings! Have you got Google Earth on your computer? If so, then download the Google Earth view of McHughs. Is this the wrong position for McHughs? If you think so, then modify its position. Click / Tap the button above to get directions from where you are to McHughs. The management is awful and customer service does not exist.....please avoid this dump!!!!! The food was really good but unfortunatly the customer service was a great dissapointment, we got charged for another customers food by mistake but had no apology and then when we complained was asked to leave????? We would have gone back again but not with service like that! good food,great mus ken haddock n mate...food staff learn to smile! I have been a regular in McHughs for about 20years now as i work across the street in Royal mail. Last weekend was the first time i have ventured upstairs to the Restaurant and what a pleasant surprise i had. The decor the food the staff and above all the ambiance was fantastic. This is a gem of a restaurant and i would highly recommend the steaks that come on a slab of roasting hot Granite that literally cooks in front of your eyes so you can have it just as you like. Go there or be square. McHughs is by far the best pub in belfast, i have always found the staff to be most welcoming and friendly and the food is amazing! I do agree the toilets are sometimes a bit unclean but you get that in every bar!!! i hav to admit the food in this bar in powerrfullll! but the bar staff are the most cheeky, ilrared people you will ever come across in your life and for the toilets...their stinking and you have to fight with the staff for them 2 let you use them!